The recent resuscitation of overdosed Chica, a six-month-old pug-cross, was a rare situation for a Saanich veterinarian, but one she’d seen before. On Friday, Dec. 16, owner Charlene Anderson had walked Chica in Mount Douglas Park prior to the dog falling sick. It’s in Chica’s curious nature to ingest items off the ground. When she became unresponsive following the walk, Anderson brought the pup into McKenzie Veterinary Services on Carey Road. Chica’s condition worsened and it was the quick thinking of experienced vet Helen Rae that recognized the condition. “I have seen many marijuana toxicities in dogs and pets, and this looked like an opioid or narcotic overdose,” Rae said. She hadn’t seen an opioid toxicity in a dog for more than five years. 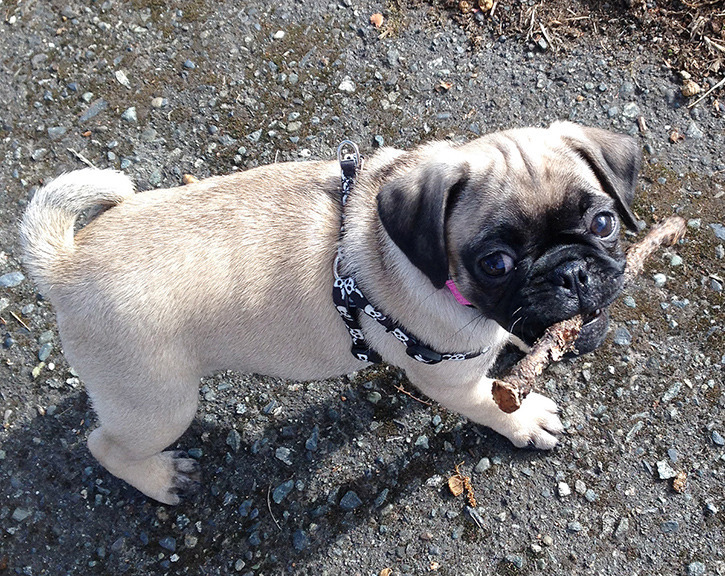 That dog had eaten human excrement in Beacon Hill Park, she said. It is common for pets to come in suffering from toxicity, particularly marijuana. The number of B.C. pets coming to the veterinarian intoxicated with marijuana is the highest in the country, Rae said. But besides being unstable and comatose in her demeanour, Chica showed none of the common signs of marijuana toxicity, such as the most common, dribbling urine, as well as drooling, diarrhoea and sometimes vomiting. Rae suspected an opioid and injected Chica with a very low dose of Narcan (naloxone), 0.15 CCs. The drug is onsite to counter the medications used for pets. It’s important to note that McKenzie Veterinary Services does not have fentanyl or other street drugs on site, said Rae, adding the clinic has had some strange calls since Chica’s story was first reported. The opioid antidote naloxone has earned a lot of attention lately as it reverses opioid overdoses in humans, and is a crucial tool during the ongoing fentanyl crisis. That prompted a second dose of the same amount, which eventually brought her to her feet. “It’s a high, high, high probably that the dog ingested a narcotic or opioid based on its reaction to naloxone,” Rae said. Opioids come in so many forms, Rae can’t know if it was oxycontin, morphine, or something else. Opioids come in pills, liquids and patches, and any or all can be mistaken as food by pets. Because marijuana also comes in so many forms, particularly edibles (cookies, brownies, etc. ), animals often mistake it for food. “With marijuana there is no antidote. We provide supportive care and IV fluids,” Rae said. Chocolate, raisins, lilies, wild mushrooms, composted material and blue-green algae all contain toxins that sicken dogs and cats. Rae has even seen a 1,500-pound horse jumping around a paddock after eating magic mushrooms. “The ‘magic’ mushrooms grow in cow manure,” she said.